Video has emerged of French President Emmanuel Macron's dog Nemo urinating on a fireplace at the Elysée palace. 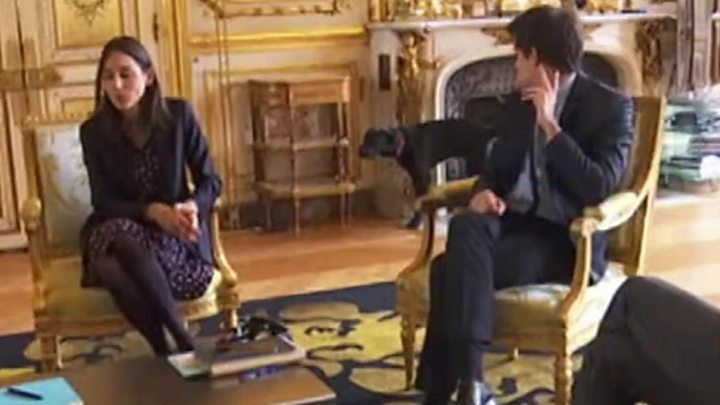 The footage shows the black Labrador-Griffon cross relieving himself in the background as Mr Macron talks with three junior members of his government. "I wondered what that noise was," says the junior minister for ecology, Brune Poirson, who had previously been talking, as they all laugh. Mr Macron then says that Nemo has done something "quite exceptional". Junior minister for planning Julien Denormandie asks if this is something that "happens often". "You've triggered completely unusual behaviour in my dog," Mr Macron responds. Nemo appeared in Mr Macron's entourage in August, continuing a tradition of French presidents having a "first dog". Mr Macron and his wife Brigitte reportedly bought him from an animal rescue centre for €250 (£225). It is not the first time a French first dog has caused trouble for its master. French investigative website Mediapart reported that Nicolas Sarkozy's dogs damaged valuable furniture in the palace that cost thousands of euros to restore. Meanwhile Jacques Chirac's miniature white Maltese, Sumo, became unhappy at having to leave the Elysée with its spacious garden and began attacking Mr Chirac, the Guardian reported. Video Can President Macron transform France?